Can people lead healthy and rich lives by the sea without diminishing the blue wealth they leave for their children? The 2010 Joint Aquarium Fiji Expedition will ponder this question as participants drift through coral canyons and measure the reef's many pulses. This year's expedition is teamed up with Conservation International to study the links between land and sea, people and ocean. We will join researchers from our two aquariums (the New England Aquarium and Monterey Bay Aquarium), CI, the University of the South Pacific (USP), and the Wildlife Conservation Society (WCS), to track changes in coral reef health over time. We are particularly interested in how reefs may have responded positively to management initiatives set up by local people, including the establishment of marine reserves to revive fish populations. We are also trying to show that forest restoration projects along streams draining watersheds of Fiji’s two largest islands can improve reef water quality. Our observations will build on the five year Marine Management Area Science Program (MMAS) and the Vatu-i-Ra Seascape project to help build a conservation vision for Fiji's future. Today, we set out to explore a new technique which has both potential to be used to measure coral health and as a backdrop for the latest Boston nightclub. 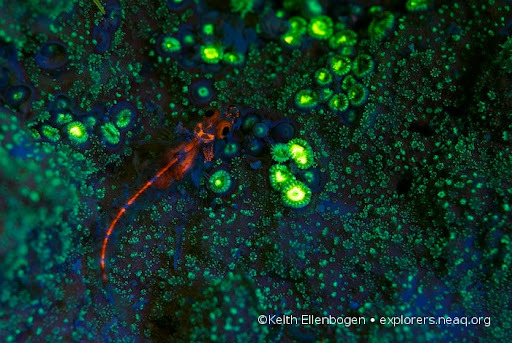 Amongst the pile of gear that accompanies us into the blue is a special set of filters and flashlights which make it possible to photograph fluorescent colors and patterns of marine organisms so that the pigments in them literally glow in the dark. This practice is slowly growing into an underwater craze for the beauty of the images it produces. By trying to understand the meaning of these patterns, we hope to develop indicators as to whether a coral has been stressed. So at the end of our first full day of diving, we adapted the filters to Keith’s underwater housing and crawled the reef in search of interesting and hopefully informative fluorescent colors and patterns. The reef under excitation of blue light is a strange and wonderful place. Tiny baby corals, very difficult to find by day, pop out in shades of fluorescent green. 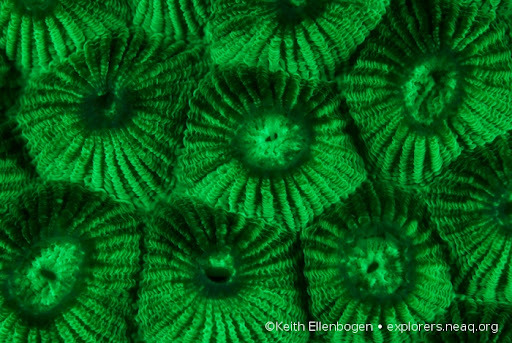 The endless competition between coral and other organisms can be visualized through "reactive zones" that appear as bright green or hot pink fluorescent areas on the corals. This first fluorescence dive on our trip revealed a wealth of information about reef ecology and function that would otherwise have been entirely missed. In a wonderful marriage of artistic expression and science, Keith’s pictures reveal a spooky world of dark whispers and revelations. 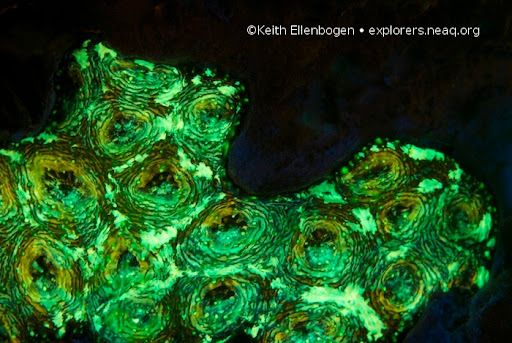 Although, it has been reported by other scientists that a few fish are fluorescent, the fine details that we saw this evening came as a powerful surprise. When we reached the surface a spectacular cosmos vaulted above us, while our feet stirred up fair competition from the constellations of bioluminescent organisms in the water. Truly a dive of joyous wonder and enduring mystery. So... what exactly are we looking at? I get that they're glowing, but what are each of the photographs showing? How much does that filter tech cost and will it work on cats. For commenters who are curious about how this works, here's an overview. Fluorescence is the process by which light is absorbed at one wavelength (color) and re-emitted at a longer wavelength (different color). For these images an electronic flash fitted with a custom-made blue filter was used to illuminate the subjects, while a matched yellow filter on the camera lens blocked the reflected blue light and transmitted only the fluorescence. Bula all! Following your trip avidly! Wish I was there with you! Hello to all! Vinaka for the great photos and blogging!